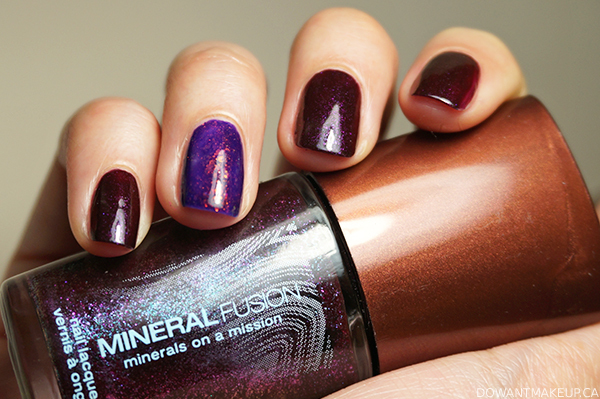 I wasn't quite sure what to think when I was first introduced to Mineral Fusion's nail polish. Considering that Mineral Fusion markets itself as a "natural cosmetic brand" with products infused with minerals, you can understand why I was kinda skeptical about this sort of brand offering up nail polish--a cosmetic product with ingredients that are far from what most people consider "natural" (it is a Household Hazardous Waste product in Canada and US, by the way.) Turns out I was worried for nothing, because Royal Rubble (and its mint sister) applied amazingly smooth and even! With that out of the way, we're on to the shade itself. Mineral Fusion Royal Rubble is a heavily red-leaning purple packed with tiny glass flecks that shift fuchsia and green. In the bottle, this shade is absolutely stunning; it has so much dimension that I just want to keep turning the bottle around in my hands forever. On the nail, however, it's a different story: all that gorgeous mini-glass fleck just gets lost and isn't all that apparent. You can tell there's a bit of shimmer there, but it doesn't come alive like it does in the bottle. Swatching Royal Rubble next to Layla Pro Vertigo Sky seems a little strange given how different the two shades look, but it made sense to me at the time. I received them both around the same time since both brands were coming to London Drugs (now available! 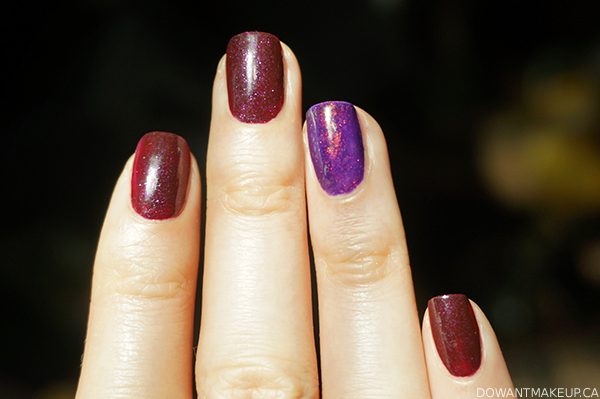 ), both were so pretty and shiny, and both still fell in the "purple" range, but they're completely different. Vertigo Sky is clearly blue-based, and the large flakies are a big contrast to the scattered, subtle shimmer in Royal Rubble. I took a photo in full natural sunlight in hopes that it would bring out more of that magic I saw in the bottle, but it's still pretty scattered. You can really see its deep, almost-oxblood base here, which is actually very close to a slightly less opaque Layla Pro Purple Vamp. I feel kinda bad going on and on about how it doesn't look like the bottle colour since it really is still a lovely colour; I don't think I would have been disappointed at all if it wasn't for the bottle colour overselling me. Have you ever been "oversold" by the bottle colour of a nail polish?